Hi everyone. On this page, I will be listing a brief summary of the changes and updates made to 500 Social Media Marketing Tips over the months that pass. I hope this will help you see the continuing work I put into the project, and encourage you to upgrade to the latest version so that you're always on top of the latest social media marketing strategy! Whole book proof read and re-edited for 2016. Added new strategies for producing top Periscope broadcasts. Added information and strategy for Facebook Live video broadcasts. Added information about Facebook Professional Services and the importance of it in relation to Pages. Added Strategy for utilising Faceboook Saved Replies. Added information and strategy about Facebook Audience Optimization. Added information about GIF support on Twitter. Added extra insight into the usefulness of Pinterest Analytics data. Added strategy about creating a cohesive Instagram brand profile. Edited mentions of Twitter "favorites" to align with change to "like" heart. Added information about where to build Instagram ads. Added information about linking Vine and Twitter accounts. Added new advice for crafting effective Instagram ads. Added advice on choosing which social networks to focus on. Acknowledged LinkedIn Groups going private. Added instructions to verify Facebook Page. Note: Plenty of updates made in October too, but I accidentally deleted my list! Added insight into the use of hashtags for community-building on Instagram. Added information about the importance of storytelling on social media. Added information about uploading landscape and portrait photos and videos to Instagram. Added strategy for creating compelling social media images and building them as an intrinsic part of your social strategy. Added strategy for maximizing the impact of Facebook ads. Amended information on best content types of LinkedIn. Added information about Facebook video custom thumbnails. Added information about the "See First" option for Facebook Page fans. Added strategy for using Instagram Discover People feature to grow exposure. Added strategy for discovering powerful Instagram hashtags. Added strategy for using People search option in Instagram to find an audience. Added strategy for using Facebook "Invite" option to encourage fan growth. Added competitor analysis questionnaire to premium content bundle. Added information about Buyable Pins on Pinterest. Added strategy to improve visual flair of screenshots. Added strategy for increasing engagement with "behind the scenes" social media posts. Updated information about DM opt-in scheme on Twitter. Added information about Layout app for making collages. Added note about using Google+ collections for business. Added information and strategy for using Promoted Pins to advertise on Pinterest. Added information about using Snapcodes to grow your Snapchat following. Added strategy to encourage fans to subscribe to Facebook Events. Added strategy for re-sharing evergreen content in interesting ways. Added idea for making use of Twitter video for marketing. Added strategy for checking Twitter analytics on the move. Added strategy for using YouTube to curate content as a way to build an audience. Amended information about the replacement of Facebook Like Box with Facebook Page Plugin. Added strategy to "ask questions" tip for best content to post on social media. Added general strategy for best practice image sizes. Added "catch all" rules for optimizing the sizes of social media images. Amended strategy for optimizing your Instagram bio for business. Added tips and strategy for using Periscope app for live streaming. Added strategy about using social content calendar to see the "bigger picture." Added strategy about using a social voice to develop your social strategy. Added strategy and information about using YouTube cards for promotion. Added information about new Facebook video embed feature. Added information about using Iconosquare for Instagram account management. Added more strategy for using Facebook Groups for business opportunities. Added insight into the benefits of great customer service on social media. Added strategy for using Twitter group DMs for business. Added introduction to Key Considerations chapter. Amended and revised advice about planning initial approach to social media for business. Amended and revised advice on the truth about organic reach and "high quality" content. Added information to tip for sharing valuable, high quality social media posts. Added strategies to maximize the use of Facebook video. Amended tips on optimization of Facebook cover photos. Added new option for including Facebook Like buttons on websites. Overhaul of Twitter advertising section. Added strategy for making the most of Twitter chats. Revised information about LinkedIn group's Featured discussions change to Manager's Choice. Added new tool for measuring and analysing Instagram for business campaigns. Added information about marketing with video on Twitter. Added resource for over 100 content ideas for social media. Added strategy on recognising fans' feedback when you don't have time to respond to every comment. Added strategy to increase click-through rates on links shared to Twitter. Added strategy to smoothen the LinkedIn prospect-building journey. Added social media customer service strategy to ensure delight of customer. Added strategy to take advantage of the LinkedIn Data Export for harnessing valuable behaviour info. Added tip to quickly spot potential new prospects on LinkedIn. Added strategy to ensure that invites sent to LinkedIn prospects can be personalized. Added strategy to help enhance engagement through giving back on social media. Added extra advice on handling negative feedback on social media. Added advice about making sure Facebook apps are optimized for mobile users. Added strategy on using Google+ hashtags for added exposure. Amended and added strategy to align with and benefit from Facebook's click bait News Feed algorithm changes. Added strategy for upping chances of being featured on LinkedIn's publishing channels. Added strategy to compound social proof using customer images and website plugins. Added strategy for finding relevant and popular hashtags to use on Instagram. Updated strategy on utilising Twitter Cards to drive click-through traffic. Added strategy for making use of trending topics on Facebook. Updated Facebook cover photo template to reflect changes to mobile display. Added strategy about best mindset to have in order to optimize Pinterest content for SEO. Added new way to use Twitter search to find mentions of your brand and opportunities to engage. Added way to automatically receive notifications for brand mentions on Twitter. Added strategy for creating an image for social media when the perfect one "doesn't exist". Added strategy about using perspective and scale for better product images. Added strategy about benefits of using human faces in your social media images. Added ways to make the most of different types of image. Added my favorite sources for finding free and paid graphics online. Added strategy for writing more credible and influential blog posts. Added advice about newsjacking on social media with class and tact. Added reasons for going above and beyond the call of duty with social media customer service. Added new ideas for social media contests. Added strategy about using brand consistency to build distinctive business account on Instagram. Added new strategy for using animated GIFs. Added extra reason for making sure to include Facebook cover photo descriptions. Added strategies to optimize Google+ Hangouts. Added information about the Google My Business hub. Added strategy for marketing with Instagram's Hyperlapse app. Added suggestions about apps to enhance Instagram videos. Optimized strategy on using hashtags for Instagram. Added strategy to make the most of Instagram photo captions. Added information pertaining to widespread access granted to Twitter Analytics. Clarified some of the key metrics for Twitter analytics/success. Added new ideas for making the most of Twitter search for business. Clarified details on making the best use of Twitter Lists, private and public. Added to strategy for optimizing Pinterest board names. Updated strategy for optimizing Pinterest profile photos. Added strategy for using Pinterest messaging for marketing. Added new ways to encourage people to your Pinterest content. Added strategy for using Pinterest analytics for business. Added new template for personal LinkedIn page cover photos. Added new strategy for making the most of LinkedIn "hero" profile photos. Added details of expanded YouTube Audio library. Added new details for adding Work/Page details to personal Facebook Page. Amended and improved advice about putting together an effective social media company policy. Amended and improved advice about making LinkedIn profiles more visually appealing. Added information about connecting and sharing Slideshare presentations to LinkedIn. Added information about Twitter's new analytics dashboard. Added information about the benefits of using a Page app for Facebook contests. Added several Snapchat content creation tips. Added methods for making animated GIFs. Added strategy for scheduling Instagram posts to maximize the impact of campaigns and promotions. Added theory about the importance of creating shareable content. Added strategy for choosing not to brand certain images on social media. Improved strategy for writing an effective Twitter bio. Added strategy for using Facebook Groups to build business. Added strategy for making the most of Instagram as a brand. Added info about the power and influence of good social media images. Added strategy for implementing Twitter Cards. Added strategy for taking better photos. Added strategy for maximising impact of Twitter link posts. Added strategy for discovering content most likely to be retweeted. Added ways to use Pages to watch to improve Facebook strategy. Added new ideas for what to post on social media. Added new strategy for dealing with negative situations on social media. Added strategy for using video transcripts to boost video SEO. Added strategy for finding relevant social media content. Added new strategy for collecting non-app Facebook contest entries. Added tools and tips for creating effective presentations for social media. Added new types of visual content to create for social media. Amended details about the implementation of Google+ Authorship. Added ideas for running contests on Google+. Amended advice on best length for YouTube videos. Amended advice about optimizing video descriptions on YouTube. Added new method to use Instagram Direct for marketing. Added method for adding three-second video intro at the start of all YouTube uploads. Added method to manage Instagram activity on desktops. Edited information about source of Instagram analytics. Added resource for discovering great animated GIF content to use on Pinterest and Twitter. Added methods to build brand personality and familiarity on social media. Added information about using emotion to create more engaging social media content. Added to strategy for writing an effective Twitter Bio. Added information about why people use Pinterest and how brands can tap into this. Added strategy for choosing the best kind of Facebook profile photo. Amended information about choosing the best Facebook cover photo. Added strategy for making most effective use of the Facebook About section. Amended strategy for utilizing custom tabs on Facebook. Added strategy for using images to drive click-throughs on Facebook. Added strategy for maximizing the reach of Twitter link shares. Added strategy about the theory of using Facebook ads for promotion versus the risk of damaging your credibility. Added new strategy to display personal Facebook profile work place as your Facebook Page. Added strategy about using holidays and special dates as cornerstones for content creation. Added methods for creating infographics. Updated details about running Facebook Offers. Amended information about adding Featured Likes to Facebook Pages. Added strategy for turning on Featured Page Owner on Facebook Page. Added instructions for uploading a restaurant menu to your Facebook Page. Updated information about using Facebook Insights, including the introduction of video metrics. Added strategy for optimising Facebook News Feed and sidebar ads. Added strategy about the types of images that work best on Pinterest. Added strategy for posting the kind of content that Instagram wants from brands. Added strategy about using Instagram trends to boost engagement and take better photos. Added strategy for creating popular and shareable Vine videos. Added strategy for taking advantage of photo trends to create shareable content. Added new methods to help claim a Google+ Local page. Complete re-editing and re-population of Blogging Tips chapter. Added new section on YouTube paid advertising. Added new method of helping to drive cross-promotion of and traffic to your Facebook Pages. Added strategy for maximising the impact of custom tabs on the new Facebook Page design. Added details on using Advanced Twitter search to find tweets by date. Added details of Emoji use on Twitter. Added strategy for using multiple images on Twitter. Amended strategy for optimizing the use of Twitter Favorites for marketing. Added information about pinned tweets and strategy for their use. Added to strategy for approaching prospects found via Twitter search. Added information about the new Twitter layout for desktop, and new Twitter templates. Added information about using Twitter Website Cards ads to drive web traffic. Added strategy to enhance Twitter engagement using search. Added information to clarify the usefulness and function of Twitter Lists for marketing. Added clarification to the benefits of posting Google+ content for search. Added benefits of sharing YouTube videos to Google+. Added strategy for enhancing images and video on Google+ by using Auto Awesome. Added strategy to grow your reach and audience for Google+ Hangouts on Air. Added strategy for optimizing posts made to Google+ Communities. Added tip for optimizing Google+ posts to appear as high as possible in search results. Added tips for choosing an agency to post on social media on your behalf. Added strategy to help discover and manage participation in LinkedIn groups. Added new strategy for using images to drive engagement on Facebook. Added clarification to explain custom tab images on Facebook that cannot be customized. Expanded strategy on using images for marketing on Facebook. Added strategy about producing effective social media advertising. Added strategy for viewing Facebook reach data from a wider, more illuminating perspective. Added strategy for using milestones to give customers a sense of ownership of your Facebook Page. Added strategy for increasing Facebook likes and shares from your website. Added reminder about the prominence of category as featured on new Facebook Page design. Optimized strategy for asking for likes and shares on Facebook posts. Added strategy for best posting infographics to Facebook. Added strategy for using Flipagram to display photos in an engaging way on Facebook. Added strategy to help maximize effectiveness of Facebook posts without forcing organic reach. Amended strategy for optimizing blog post images on Facebook. Added new ways to utilize contests on Facebook. Added strategy for encouraging click-throughs to linked content. Amended strategy for posting top notch content to Facebook multiple times. Added information about crafting effective blog headlines. Added strategy for using Vine Messages for business. Added detail about Vine profile customization. Added information to the background history of Snapchat. Added details on the use of Emojis on Snapchat. Added recommended sizing info for YouTube custom video thumbnails, and recommended creation tools. Added strategy for driving web traffic and optimizing seo from video pins on Pinterest. Added strategy for using "Popular on Pinterest" cards to drive sales on your website and in-store. Added information about how Pinterest's Guided search will influence crafting of pin descriptions. Added to and amended strategy on inviting guests to pin to your Pinterest boards to drive interest in your brand. Added information about why even "non-visual" brands can benefit from Pinterest. Added strategy for using Instagram Direct to target passionate fans. Added strategy for using Instagram to stream social proof UGC to your website or Facebook page. Added strategy to help answer the question "when is the best time to post on social media?" Added tips for writing effective evergreen blog posts and effective headlines. Added new apps to overlay text onto Instagram images. Added strategy for carrying out an audit to shape your social media content strategy. Added strategy about the benefits of automating certain tasks on social media. Added information about the importance of having a long-term social media strategy. Added more strategy for handling customer complaints and criticism on social media. Added strategy for creating Associated Website Annotations on YouTube to drive web traffic. Added instructions for setting up a Featured Like on a Facebook Page. Expanded strategy on the impact of Facebook reach and engagement. Added new strategy for collaborating and cross-promotion on YouTube. Added more advice on getting the most out of Facebook ads. Added new information to help organize and manage contacts and relationships on LinkedIn. Added info about tracking referrals using Google URL Builder. Added extra strategy for using Advanced Twitter search to hunt down prospects. Added strategy about creating custom Facebook lists to interact and engage with peers. Added to and clarified strategy about creating and migrating Facebook Timelines and pages. Expanded strategy on using animated GIFs within social media marketing. Added information about accessing my premium video content. Added strategy for using Facebook Debugger tool to overcome link preview issues. Added information about the benefits of visual storytelling in social media. Expanded core ideas of using Pinterest as a social media strategy. dded extra strategies for using Place Pins boards on Pinterest. Added strategy for making the most of website and About section URLs in the new Facebook Page layout. Amended and improved strategy for using Facebook custom tabs to reach your audience. Added extra detail for strategy to promote products and services on Instagram. Added detail to the culture of Instagram to help brands thrive on the platform. Amended and added to strategy for using LinkedIn groups to build authority and make connections. Added information and strategy for using LinkedIn ads. Added additional strategy for running successful Facebook contests. Updated information about using Twitter as a way to gain an upper hand on competitors. Added additional clarity to categorization tips on Facebook, and when Facebook Insights can be accessed. Added detail and clarity to the use of Facebook ads for promotion. Amended strategy for getting the most out of Facebook hashtags. Updated info on the types of images and placements to experiment with in Facebook ads. Added strategy for using the LinkedIn publishing platform to expand your influence and build credibility. Added information about the best types of posts to share on LinkedIn. Added additional strategy for getting the most out of boosted posts on Facebook. Added new core strategy on how best to approach and succeed on social media from a brand perspective. Amended information about how best to write effective Pinterest pin descriptions. Updated strategy about using taller images on Pinterest to drive engagement. Added information about optimizing Pinterest pin description strategy. Added information about Showcase Pages replacing Products and Services tabs on LinkedIn, updated Showcase Pages strategy. Added strategy about multiple image uploads on Twitter and tagging photos. Amended strategy for using images on Twitter for visual messaging and teasing offers. Added detailed step-by-step guide to running a successful Instagram contest. Added information about how to verify your website on Pinterest, and its benefits. Completely re-ordered LinkedIn Tips chapter for clarity and ease of reading. Added tips and apps for posting non-square images to Instagram. Added information about how to share photos from Instagram direct to your Facebook business Page. Added tip to encourage Instagram users to follow you using your Bio. Added advice about how to take advantage of the "culture of Instagram" to market businesses on the app. Amended Facebook strategy for the benefits of being on the cultural pulse. Expanded on ideas for promoting products and services using Instagram. Added strategy for asking effective questions on Instagram. Added strategy for offering hints and tips on Instagram. Added extra strategy for attracting followers on Instagram through active engagement. Added extra information on the impact of combining several photos using Instagram. Added strategy for inventing and posting consistently powerful content to Pinterest. Added strategy for using Pinterest descriptions to encourage repins. Added strategy to drive traffic and sales using product pins and descriptions on Pinterest. Added insight into the power of Instagram as a promotional tool for brands. Added strategy to keep customers engaged on YouTube using an ongoing, two-way dialogue. Added extra information on the importance of Facebook ads as part of a sound social media strategy, and tips for how to maximise their potential. Added strategy to utilize LinkedIn contacts tags to group and organize connections for efficiency. Expanded strategy for using Miletones on Facebook as a marketing opportunity. Added strategy for targeting prospects on Google+ by email. Added information about full roll out of LinkedIn publishing platform and "follow" function, and its benefits. Added suggestions and strategy for holding Pinterest contests. Expanded strategy for asking questions on Facebook, and the potential benefits. Added information about editing Facebook links to increase click-through rates. Added information about using Buffer to schedule and automatically post evegreen Twitter content. Added strategy for using Twitter widgets and buttons to attract followers and increase social selling. Added strategy for using TweetThis to encourage selling. Added the use and benefits of pinning important posts on Facebook. Added strategy for following and interacting with Twitter chats in real-time. Added advice for judging the optimum length of social media text posts. Added strategy for using Facebook Graph search for audience research purposes. Added strategy for mentioning Pages in Facebook as a new opportunity to drive traffic back to your own Page. Guide to using paid advertising on Twitter including the types of ads available, targeting options, budgeting advice, and tracking ROI. Added new information about dealing with disputes and bad behavior on Facebook Page walls. Updated information about Facebook's News Feed Algorithm (formerly Edgerank). Added new tactic for taking advantage of Pinterest's Secret Boards feature. Updated information about choosing a custom Vine web profile URL. Added benefits and instructions for using YouTube's Fan Finder feature. Added instructions about how to manage fans and measure ROI on Snapchat. Added direction on managing comments on YouTube. Updated advice about which social networks to target depending on your business and target audience. Added information about building a content strategy that will resonate with audiences. Added new information about targeting customers througout the year, all planned in advance with a social media content calendar. Added advice on targeting customers with content that will resonate with them. Added strategy for uploading snaps direct from Camera Roll to Snapchat account. Added strategy for utilizing animated GIFs on Pinterest. Updated strategy on which types of post get the most engagement on Facebook. Added information about Facebook Page admin replies to reviews. Revised information about the appearance and use of the "Get Notification" function for Facebook Pages. Added strategy for including multiple website addresses in Facebook Page About section. NEW CHAPTER ADDED: Snapchat Marketing Tips. Brand new chapter explaining what Snapchat is, its growth as a tool for social media marketing, and the different ways that businesses can put the mobile app to use. Numerous content strategies explained in detail, with examples, including advice on Snapchat's delivery method as an opportunity rather than a limitation, and the best ways to use Snapchat stories. Updated information about competition for space in the Facebook News Feed, and the importance of creating engaging, timely, content. Updated information about using Boosted Posts and Facebook ads to maintain reach. Updated guidance about what size images to upload to Facebook Page Timelines for optimum showing. Expanded on strategy for using Facebook Page cover photo for promotion and value to fans. Updated information on the creation and promotion of Facebook offers. Updated information about creating Facebook Events and their benefit to business' Pages. Added information about the benefits of a social media content calendar, and provided a link to download a social media content calendar template. Updated information how to upload optimum Google+ profile photos without cropping. Added information about the importance of a Facebook ads budget for promotion and reach. Added information about how to get a custom Vine profile web URL. Added extra advice for testing and optimizing the performance of Facebook ads. Added brand new Snapchat Tips chapter, with overview of app and strategies for business. Updated information about new recommended size for Google+ cover photos. Created and referenced new template to help design optimized Google+ cover photos. Added new strategies for using images to drive engagement and sales on Facebook. Amended and updated strategies for promoting your social profiles online and offline. Added info on accessing hub for all Facebook assets for branding online and off. Added info about how to use custom Twitter timelines for content curation and marketing. Added new trick about using call to actions in Facebook cover photos. Added new strategies for using hashtags for marketing on Facebook. Added new strategies for using questions and emoticons on Facebook. 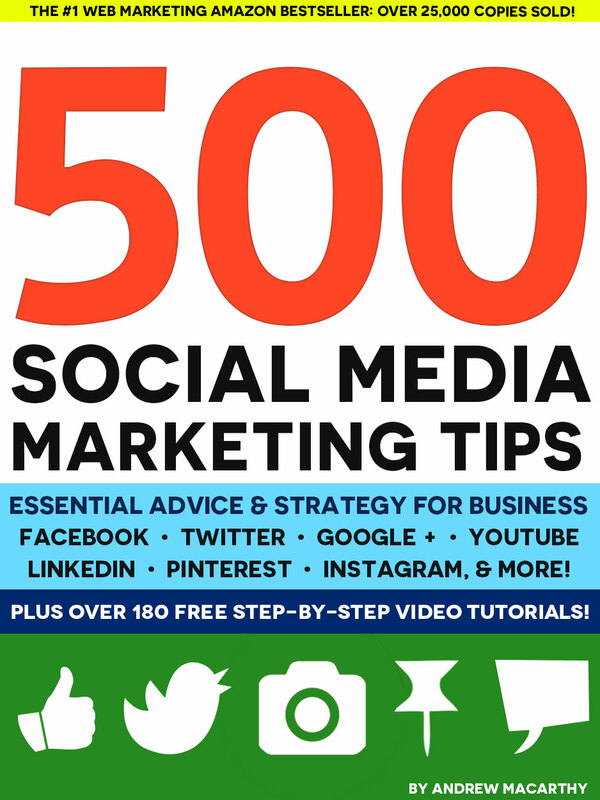 Updated information about how to receive free updates of 500 Social Media Marketing Tips on Kindle. Updated information about the ethos and benefits of social media. Updated information about managing social media expectations. Expanded information about using Twitter chats for business marketing. Added information about new LinkedIn Showcase Pages. Added template for LinkedIn Showcase Pages Hero (cover) Photo. Added information about using Place Pins on Pinterest for business. Added numerous new strategies for using Facebook personal profile to make business conntections. Facebook section restructured and reorganised into defined sections. Added information about using Slideshare to increase Twitter followers. Added info about "Get Notifications" prompt on Facebook Pages. Edited information on workings of Facebook EdgeRank algorithm. Updated information about using external apps to get unique and more professional shots onto Instagram. Added info about using Advanced Search to find prospects on LinkedIn. Amended info about personalising LinkedIn connection invitations. Added strategy about building relationships with new LinkedIn connections. Added information about how to make square logos fit Instagram's circular profile pics. Amended info about saving original copies of photos in Instagram app. Amended info on additional filters, text overlays, editing comments, and Lux effect in Instagram. Updated strategy and statistics about using photos and videos within tweets on Twitter. Added strategy about using Instagram Photo Map for users without a physical location. Added additional information on meeting Facebook's contest guidelines. Amended and added information about using imported videos in Instagram. Amended information about newsletter signup free gift. Added stats about buying rates of fans who follow brands on Twitter. Added information about Facebook Graph Search's expanded functionality. Added info about YouTube's new and improved commenting system. Added info about accessing hundreds of free music tracks for YouTube videos and other projects. Added info about using Get Introduced to contact 2nd and 3rd degree connections on LinkedIn. Updated introductory paragraph with new statistics and evidence of the growth and power of social media marketing and social commerce. Added information about two new Vine app modes that enable saving and editing of recording sessions. Amended Facebook cover photo template for mobile devices. Updated information about way images display in Twitter news feed, and strategies to take advantage. Updated info about the way Vine videos display in Twitter and added strategy to take advantage. Updated information about getting a custom Google+ URL. Updated information about the use of Facebook customer reviews. Added new Facebook Graph search example for learning about customers. Amended information and advice about using Boosted Posts, Facebook ads, and Power Editor. Added information about embedding Google+ posts. Updated information about best use of calltoactions. Amended information on benefits of employee profiles on LinkedIn. Updated information on Facebook 'Short Description' section and new character limits. Updated info about linking YouTube ad Google+ accounts. Added info about using infographics on Slideshare. Updated and amended information about creating effective YouTube video titles. Added new information about what makes Pinterest pins successful. Added new information about the types of repins to share on Pinterest boards for higher engagement. Added information about importing existing videos into Instagram video mode. Added information about update to Facebook News Feed algorithm. Updated information and effectiveness of using text overlays for images on Pinterest. Improved information about YouTube call to actions. Added information and strategy about embedded posts on Facebook. Revised information about recommended image size for posting on Facebook. Added information and strategy about the restricted use of links at beginning of Slideshare presentations. New section on recording video with Instagram. Revised information about using hashtags in Instagram. New techniques for making great Vine videos. New info on recording video with Vine. Updated tips for Facebook Offers and Boosted Posts. Added information and tips about using hashtags on Facebook. New strategy for utilising Facebook cover photo for marketing. New information on official Facebook Text In Image tool. New and revised information on Facebook cover photo promotions. Revised information on new YouTube One Channel branding strategy. Revised information on watermarking YouTube videos. Updated information on ability to use YouTube custom thumbnails. Revised information on YouTube channel branding. Provided link to new and revised YouTube banner art work template. Added information about embedding YouTube "Subscribe" widget to websites. Revised and added to information about sharing YouTube videos to other social networks. Removed information about creating YouTube playlists. Updated Google+, Pinterest and iTunes user statistics. Updates to instructions to add YouTube channel keywords and associated website. New strategy to optimize channel trailer description hyperlinks. Added and revised information about Google+ Authorship. Revised and added info about Google+ buttons and badges. New information about the benefits of Google+ Hangouts. New tips about the best photos to use on Pinterest. Several new tips for Vine app technical considerations and videomaking. Updated information and requirements for creating a Foursquare Page. Added chapter for free social media templates. Typo correction and general formatting tidy up.